Ready to get started with SmartLoop? See how to create your first Loop, step-by-step! Welcome to SmartLoop! 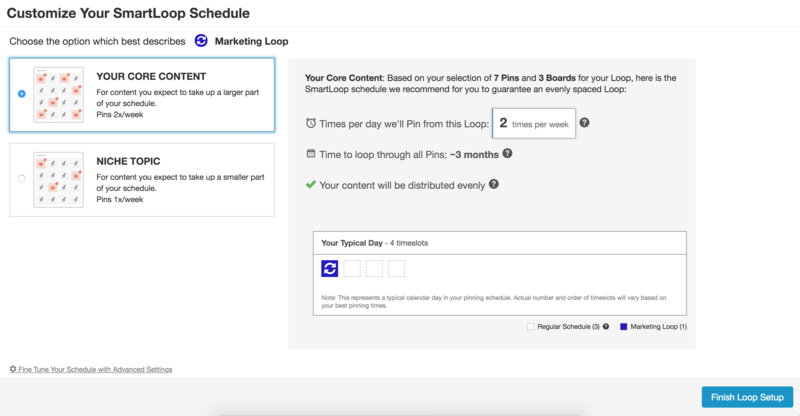 SmartLoop was created to help you save time by resharing your existing evergreen or seasonal Pinterest content so that you have a better opportunity to get it in front of more people who are likely to engage with it. With SmartLoop, you can set up collections of Pins that you want to reshare. These collections of Pins are called Loops. 3. Here, you'll see the option to select an Evergreen Loop or a Seasonal Loop. Evergreen Loops will run year-round. Pins in Evergreen Loops will publish continuously - this means this kind of Loop is perfect for your best performing blog content on general topics such as organizational tips, fashion ideas, craft projects and recipes. Seasonal Loops have start and end dates, and are perfect for more seasonal content such as Halloween recipes, Christmas pins, or springtime projects. 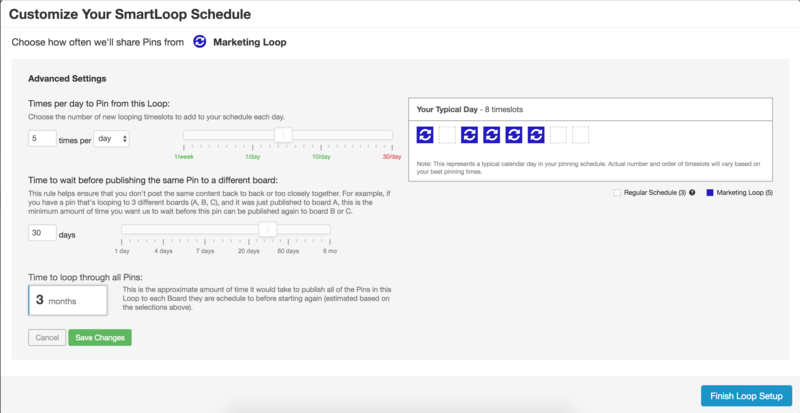 You'll have the option to set specific time ranges for these Loops. Helpful tip: No pressure, you can always go back and change this! 5. The next step is adding Pins to your Loop! You'll also notice that you have the option to select the entire Board, too, as long as your Board includes less than 25 unique Pins and you're confident that all the content on that Board will fit into the Loop! Helpful tip: Since repeatedly sharing unengaging content can hurt the distribution of all your content, only share Pins your audience engages with. You can certainly loop your newest content, but you’ll want to keep an eye on its performance over time. Helpful tip: Choose a schedule based on what is most important. 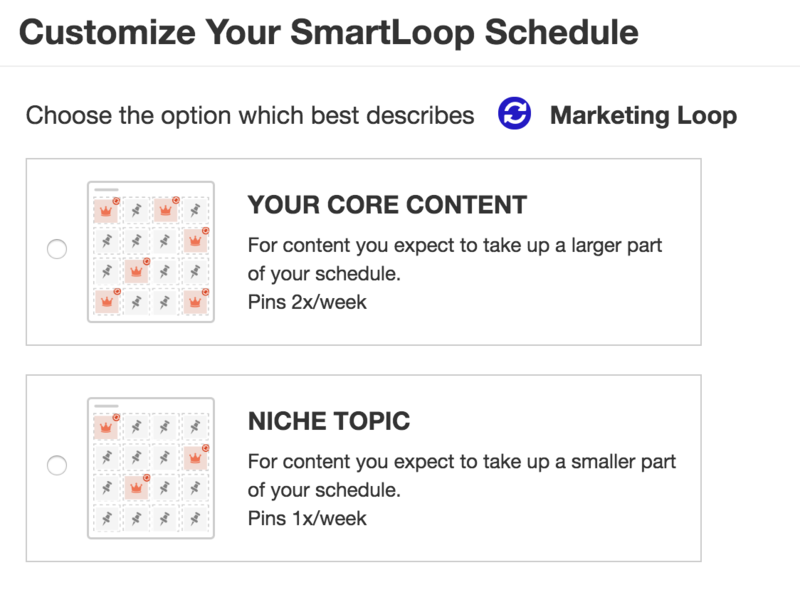 For your Loop(s) with your most important content, choose “YOUR CORE CONTENT.” This loop will occupy more room in your overall Pinning schedule. If you want to get into more intricate detail, click Fine Tune Your Schedule with Advanced Settings in the bottom left corner. Once you have things set up the way you'd like, click Finish Loop Setup and voila! Your first Loop has been created!